I thought I would show off a triathlon training dashboard that incorporates all aspects of performance at a high level. The back end to this is proprietary, but it illustrates the importance of looking at the larger picture when achieving peak performance is crucial. Weight and TM Performance score. Focusing on these two variables, the triathlete can then start tracking toward improved performance and reduce their TrainingMetrix Performance Score. 2009 was such an awesome year for my fitness goals. I finished three triathlons, half dozen running events, and found inspiration where I never thought I would. 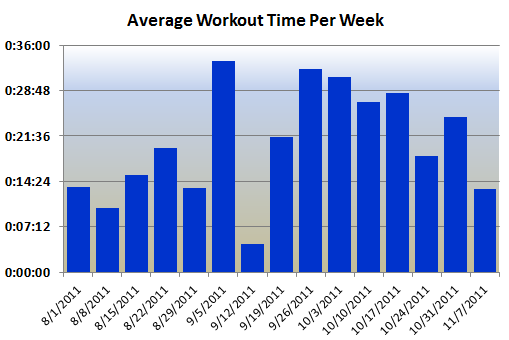 With my recent completion of the UCSB Triathlon, I am looking toward 2010 with more motivation than ever. That sense of competition, meeting people and hearing their fitness stories, sharing tips, pushing myself to the next big milestone, and enjoying the wonderful outdoors all make my 2010 fitness goals that much more alluring. With one down, what’s next? Morro Bay triathlon, a very unique race, including a 3 mile kayak of the Morro Bay Harbor. I have never kayaked before, which makes this that much more challenging. Time to start kayak lessons! The bike and run will be great as well, but the kayak is the icing on the cake. After Morro Bay, let’s PR (personal record) at the Ventura Triathlon Sprint, my first triathlon of my fitness career. This year they are taking the venue to the harbor, with a challenging swim, an awesome bike, and run around the harbor. Last year I did well, finishing it in 1:38:00, but this year will be even better! Of course, the biggest goal this year is the Santa Barbara Triathlon Long Course. This will be the longest triathlon I have ever done to date. While I may not do it fast, finishing is going to be sweeter than finishing the recent UCSB Triathlon course. In addition, I plan to carry forward with many running events in 2010, I already have done two, the Boney Mtn Trail Run, the Resolutions 5k. Coming up in April is my first 10-mile run, the Chardonnay 5k/10 fun run. I will also be putting my FiveFingers to use and using them in more events, on and off the road. Barefoot running is the wave of the future. Looking at this brief list, I am amazed at the challenges ahead. As dauting as they appear, meeting each one head on and putting them into the history books is going to rock! I have just seven days to pull myself together and get ready for the UCSB Kendra Payne Triathlon. Ever since I hit burnout a little more than a month ago, getting going again has been a huge struggle. At one point, I even decided I was not going to participate this year. Of course, this disappointed everyone, but since everyone is going to be at the LA Marathon, it is not like they will miss seeing me cross the finish line in Santa Barbara. So…. 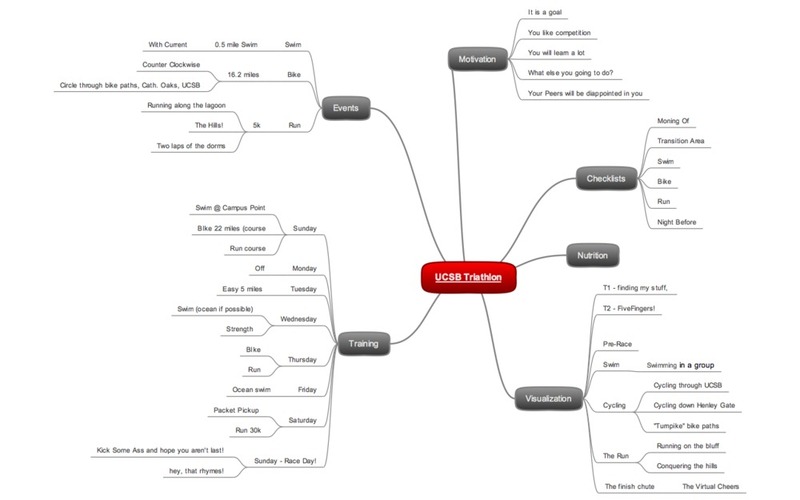 Anyway, to help get my head around preparation for the event, should I choose to accept it, I created a mind map showing the event, the final week’s training, some visualization focal points, checklist and nutrition. Seeing all of these things laid out on an image, really helps me to gather and visualize the different areas that I need to focus on. Anyway, if you aren’t doing anything from 8:00am to 12:00pm on March 21st, please come by UCSB and cheer us triathletes on. Some of us really could use your support! With just seven days to go… miracles can happen! With my impending 8-mile endurance run coming up tomorrow up tomorrow, I thought I would allow the world to vote on which route I should run. All routes are roughly 8 miles in length and all have flat and hilly areas to them. If you are familiar with the greater Santa Barbara/Goleta area, you will have better insight into these routes. If not, just vote randomly. This poll will remain open up until 5 minutes prior to Aric’s departure for the workout, which will be sometime Dec 27th morning (PST). The Hollister/Cathedral Oaks Route linky. Thank you very much! I will post the run workout results shortly after I recover! Please head over to Aric In Training and vote for the route of his run on Sunday. He wants the world to choose his route!